Equatorial’s 100% owned Mayoko-Moussondji Iron Project (“Mayoko-Moussondji”) has the exceptional advantages of having the potential to produce a premium iron product and access to existing transport infrastructure. These advantages create the opportunity for production to commence at Mayoko-Moussondji at a fraction of the capital cost of almost all other African based iron ore developers and producers. Mayoko-Moussondji is located in the southwest region of the ROC and has access to an existing railway line running directly to the deep water port of Pointe-Noire. In March 2014 the ROC government awarded Equatorial a Mining Licence for Mayoko-Moussondji, giving the Company the exclusive right to mine within a 615.5 km² area that contains all defined Mineral Resources. The Mining Licence is valid for an initial period of 25 years and is renewable, upon application by Equatorial, for further periods of 15 years. 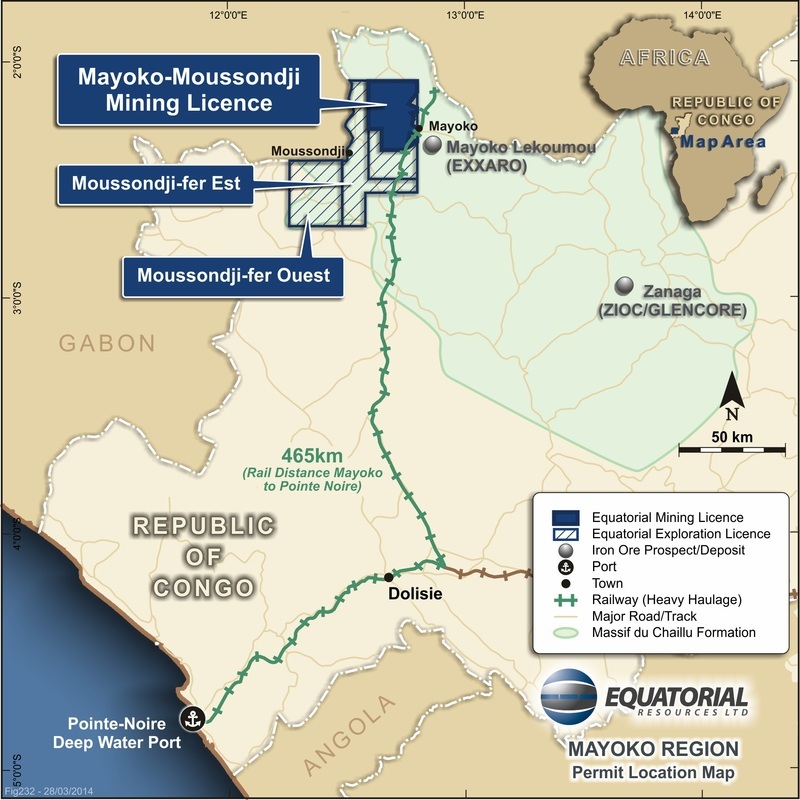 Equatorial is now working with the ROC Government to quickly conclude the associated Mining Convention Agreement and definitive rail and port access agreements for Mayoko-Moussondji. The Mayoko-Moussondji Project currently hosts a Hematite Resource Estimate of 182 million tonnes at 35.7% Fe as part of a total JORC Mineral Resource Estimate (hematite and magnetite) of 917 million tonnes at 31.4% Fe (refer ASX Announcement 4 December 2013). Equatorial’s metallurgical test work has demonstrated the hematite mineralisation is readily upgradable to a premium 64.1% Fe iron fines product with low impurities. 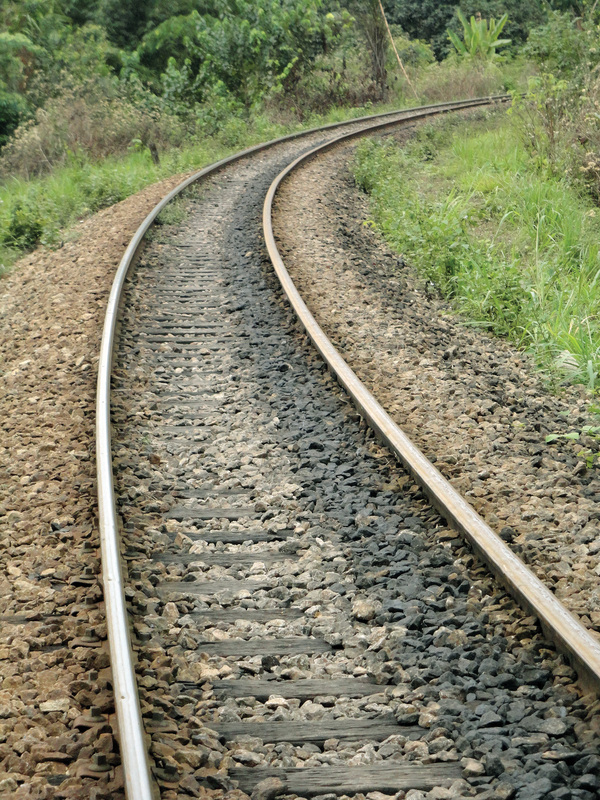 Equatorial plans to commence initial operations at Mayoko-Moussondji using the existing railway line and port facilities that service the project. 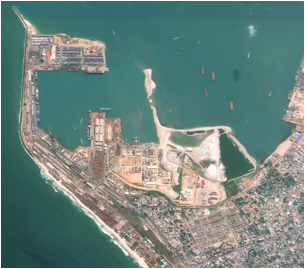 Initial production is targeted to increase in stages and the Company will seek to collaborate with other bulk commodity producers in the development of future large scale rail and port solutions. 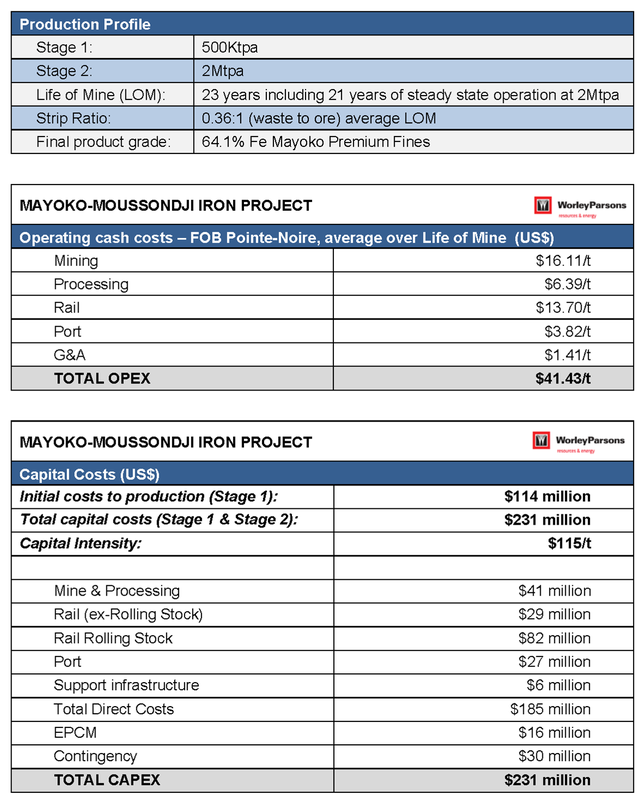 In July 2013 Equatorial published the results of its Scoping Study for Mayoko-Moussondji that investigated the development of a 2 million tonne per annum (“Mtpa”) operation based on the maiden Indicated and Inferred Hematite Resource published in February 2013 (refer ASX Announcements 4 February 2013 and 16 July 2013). 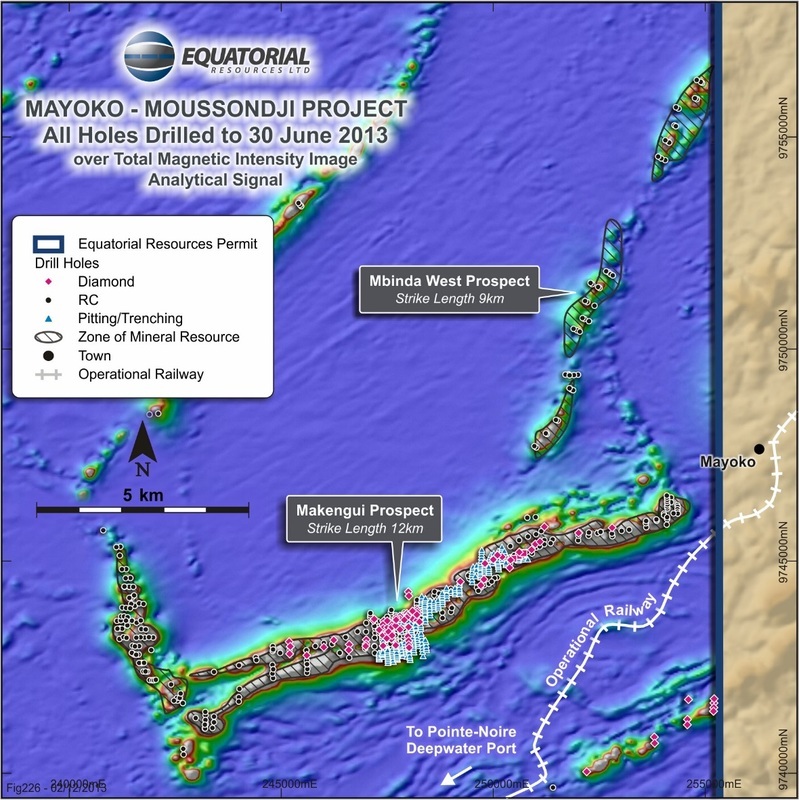 Equatorial’s project management team using consultants from WorleyParsons Services Pty Ltd and Orelogy Pty Ltd have continued to refine the Company’s proposed development plan since the Scoping Study for Mayoko-Moussondji. Various initial aspects of this work, including updated port solutions and optimisation of the overland transport plans were incorporated in to the feasibility study which was lodged with the ROC Government as part of the Mining Licence Application in December 2013 (refer ASX Announcement 11 December 2013). The Company advises the Scoping Study results and Production Targets are preliminary in nature as conclusions are drawn partly from Indicated Resources (being 25% of the total hematite resource that the Scoping Study results and Production Targets were based on) and Inferred Resources (being 75% of the total hematite resource that the Scoping Study results and Production Targets were based on). The Scoping Study is based on lower-level technical and economic assessments, and are insufficient to support estimation of Ore Reserves or to provide assurance of an economic development case at this stage, or to provide certainty that the conclusions of the Scoping Study will be realised. There is a low level of geological confidence associated with inferred mineral resources and there is no certainty that further exploration work will result in the determination of indicated mineral resources or that the production target itself will be realised. The Company has concluded it has a reasonable basis for providing the forward looking statements in relation to the Scoping Study results and Production Targets. The detailed reasons for that conclusion were outlined in detail in the section headed “Forward Looking and Cautionary Statements” of the Company’s ASX announcement of 16 July 2013. The feasibility studies progress is continuing and the Company is assessing the opportunity to incorporate a revised mine plan based on the upgraded near surface hematite material, the rail and port advancements and other Project refinements into a JORC compliant Pre-Feasibility Study.